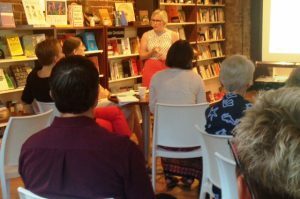 Institute for Public Leadership partnered with OTOC to hold 5 great events at Urban Abbey during July. The events included both celebrations of our culture though song and stories, a workshop on writing letters to the editor and safe rental housing, and discussion of a provocative new book. 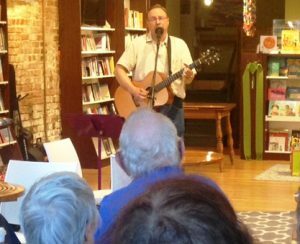 Friday, July 14: Kyle Knapp played a delightful blend of folk, rock and pop on his acoustic guitar to 35 OTOC leaders and fans. Kyle told stories and shared classic folk songs and some of his own compositions. Come see Kyle again a future OTOC and IPL events. 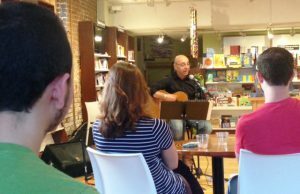 Tues., July 18: Juan Carlos Veloso shared Spanish language protest music from Latin America, and especially songs from Chile, his native country. Juan Carlos’ mother joined us that evening along with 32 friends and OTOC leaders. He taught us about the struggles of many Latin Americans for justice. Thurs. July 20: Kaitlin Reece of Voices for Children and Tyler Richard of ACLU of Nebraska taught 20 engaged leaders how to develop an effective Letter to the Editor and Opinion piece to submit to local newspapers, newsletters and other sources of information. This informative session inspired those present to write more letters on issues of interest. 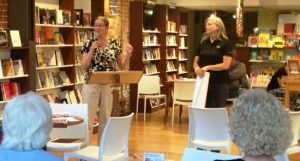 Tues., July 25: How To Assure Safe Rental Housing Leaders of OTOC’s Housing Action Team hosted Kat Vinton from the Omaha Healthy Kids Alliance and Prof Kate Mahern of the Creighton Law School legal clinic to discuss the dangers to children from poorly maintained rental housing. OTOC leaders focusedfo cus on how to make Omaha’s Housing Code Enforcement more effective and follow up on commitments City Council members made to OTOC to assure rental housing meets health and safety codes. Over 40 people from diverse groups attended this session. Thurs. July 27 Twenty Five OTOC leaders gathered to discuss the implications of the provocative new book, On Tyranny: Twenty Lessons from the 20th Century , by Timothy Snyder. Mary Spurgeon of First United Methodist lead the discussion around the ideas in the short but important book. IPL and OTOC will hold a future book discussion in the Fall. 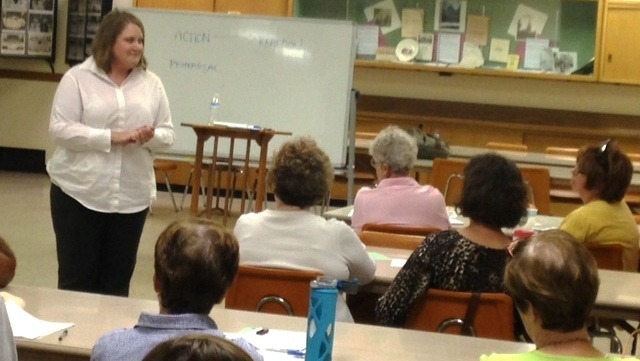 Liz Hall, Lead Organizer of our Iowa sister organization, AMOS, will lead an engaging workshop on how to identify and develop a team of leaders in your congregation or organization which will “agitate” your institution to live up to its core values and beliefs. During this time of divisiveness, learn how to build community through discussion and honest reflection on our shared beliefs and values.